Yes. The Earth is already showing many signs of worldwide climate change. Average temperatures have climbed 1.4 degrees Fahrenheit (0.8 degree Celsius) around the world since 1880, much of this in recent decades, according to NASA's Goddard Institute for Space Studies. The rate of warming is increasing. The 20th century's last two decades were the hottest in 400 years and possibly the warmest for several millennia, according to a number of climate studies. And the United Nations' Intergovernmental Panel on Climate Change (IPCC) reports that 11 of the past 12 years are among the dozen warmest since 1850. The Arctic is feeling the effects the most. Average temperatures in Alaska, western Canada, and eastern Russia have risen at twice the global average, according to the multinational Arctic Climate Impact Assessment report compiled between 2000 and 2004. Here are the basic facts on global warming. FACT: There is no debate among scientists about the basic facts of global warming. FACT: Although water vapor traps more heat than CO2, because of the relationships among CO2, water vapor and climate, to fight global warming nations must focus on controlling CO2. 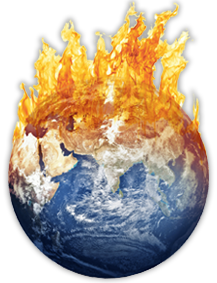 FACT: Any beneficial effects of global warming will be far outweighed by damage and disruption. MYTH: Global warming is just part of a natural cycle. The Arctic has warmed up in the past. FACT: The global warming we are experiencing is not natural. People are causing it. FACT: Although humans as a whole have survived things such as drought, stretches of warmth and cold and more, entire societies have collapsed from dramatic climatic shifts. FACT: While different pockets of different countries have experienced some cold winters here and there, the overall trend is warmer winters. FACT: In most parts of the world, the retreat of glaciers has been dramatic. The best available scientific data indicate that Greenland's massive ice sheet is shrinking, less ice leads to more warming and feeds global warming. FACT: Global warming and the ozone hole are two different problems.